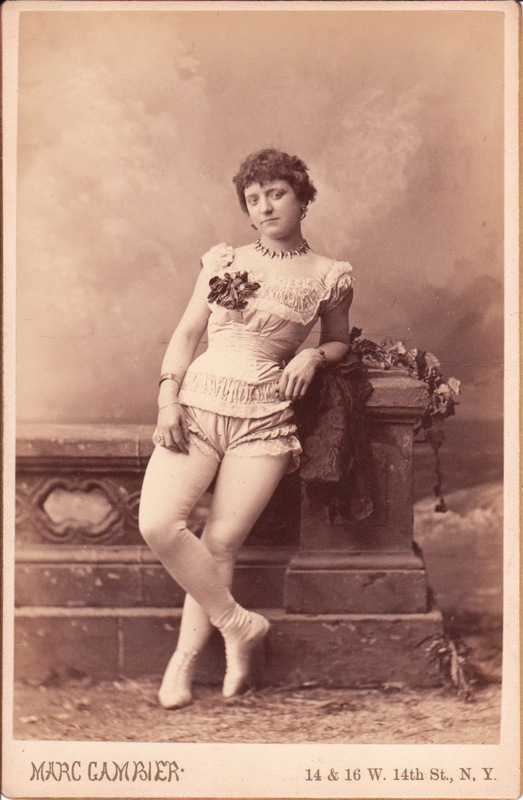 This cabinet card portrait features a pretty young woman who was quite a daredevil. She was the first female canonball. Her stage name was Rose Zazel. In this photograph she is wearing her namesake rose as well as a necklace, bracelet, and earrings. She is also wearing a risque costume. Miss Zazel’s act involved being shot from a spring loaded cannon invented by “The Great Farini”. Zazel’s given name was Rossa Matilda Richter and she was just 14 years of age when she was engaging in this exciting but reckless behavior. At one point, she toured with the PT Barnum Circus. Eventually she suffered a career ending injury when she missed a safety net and suffered a broken back. The information I cited about Rose Zazel comes from an interesting article on Scribol.com. The article is entitled “Seven Most Mind Blowing She-Daredevils in History” and it was written by Karl Fabricus. The article included the image below which is a poster advertising an appearance of “Zazel the Human Projectile”. This cabinet card image was photographed by Marc Gambier, a well known photographer of celebrities. You can view more of his images and learn more about him in the category “Photographer: Gambier”.